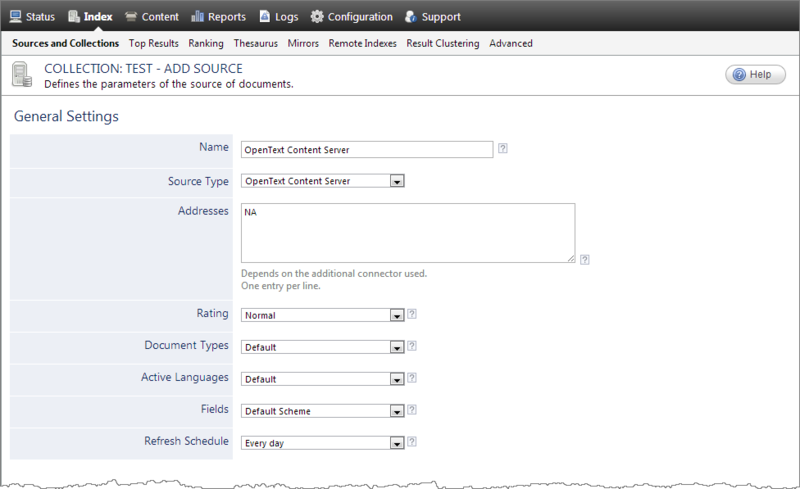 A source defines a set of configuration parameters for a specific OpenText Content Server (OTCS). Note: In an environment with more than one OTCS, you need to define one source for each OTCS that you want to index. Select the connector used by this source. In this case, select OpenText Content Server. Notes: If you do not see OpenText Content Server, your environment does not meet the requirements (see OpenText Content Server Connector Requirements). You can also use the OTCS connector to crawl a Livelink version 9.7.1 source. You need to add a hidden parameter to do so (see below). Enter the document or folder IDs that you want to index. One ID per line or * to index the whole OTCS content from the Enterprise Workspace root. Note: CES 7.0.6830– (July 2014) This parameter is not used for the OpenText Content Server connector, but must not be left empty. Enter NA. You can find the ID for a node in OTCS by clicking the Functions icon of an item, selecting Properties > General on the menu, clicking Change next to Nickname, and then read the Item ID value. Time interval at which the source is automatically refreshed to keep the index content up-to-date. The recommended Every day option instructs CES to refresh the source everyday at 12 AM. By default, when an OTCS metadata name matches the name of a CES standard or custom field, the metadata value is automatically mapped to the CES field and the field can be used to make the search interface results more relevant. It is a good practice to create a custom field set that and fields with names matching those of your signification OTCS metadata (see What Are Field Sets?). If you defined custom field sets, ensure to select the most appropriate for this source. Note: This is the same value that you entered for the Web Service Url parameter when you configured the security provider (see Configuring an OpenText Content Server Security Provider). Enter the URL pointing to the OpenText Content Server necessary to have valid clickable URIs. By default, when an OTCS metadata name matches the name of a CES standard or custom field, the metadata value is automatically mapped to the CES field. When this default behavior is sufficient to leverage OTCS metadata, leave this field empty. When you want to control more precisely how to map OTCS metadata to CES fields, create a custom mapping file and enter the absolute full path pointing to your file (see Creating an OpenText Content Server Connector Mapping File). Enter the number of threads that will be used to retrieve OpenText Content Server content. The default value is 2. Click Add Parameter when you want to show and use advanced source parameters (see Modifying Hidden OpenText Content Server Source Parameters). Keep this check box selected (recommended). By doing so, all subfolders from the specified portal address are indexed. In the OpenText Content Server Security Provider drop-down list, select the security provider that you created for this source (see Configuring an OpenText Content Server Security Provider). 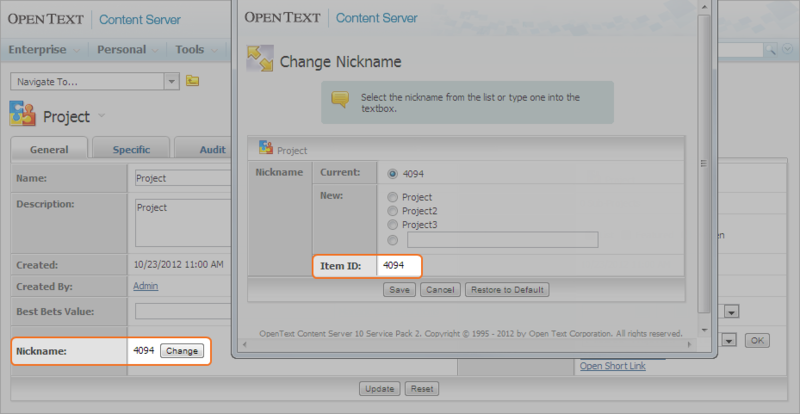 In the Authentication drop-down list, select the user identity that you created for the OpenText Content Server. If you experience issues or want to fine tune how your OTCS source is indexed, consider using hidden OTCS source parameters (see Modifying Hidden OpenText Content Server Source Parameters).